14 Foods To Help You Get A Better Nights Sleep #infographic ~ Visualistan '+g+"
It is recommended that adults should, on average, get 8 hours of sleep each night to function as best the can the following day. However, for many of us, this is near to impossible. With demanding jobs, many people suffer from anxiety or stress which then makes it even more difficult to switch off. In the US alone, it is thought that over 60 million adults each night struggle to get any kind of sufficient sleep. So what can we do to improve our sleep each night? While sleeping tablets and supplements do work, largely they are intended for short-term use only. If medication isn’t an entirely viable solution, what other options do we have? One surprisingly simple answer is food. There are a number of different foods which have been scientifically proven to help us drift off to the land of nod. 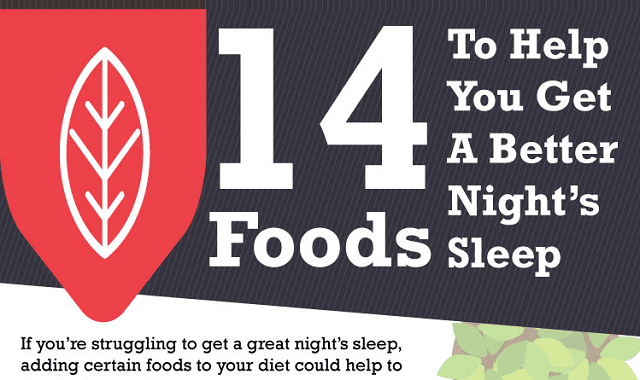 Bedding retailers Sleepy People have put together a great infographic called ’14 Foods To Help You Get A Better Night’s Sleep’. The infographic lists a range of snacks and beverages which, for a variety of reasons, can help us get a better night’s sleep. Take a look below and you might just find the sleep aid you’ve been looking for.